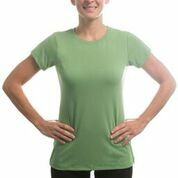 Sublimation Ladies Slim Fit T Shirts, Vapor Apparel is quality blank performance apparel for the to the sublimation, screen-printing, & embroidery industries. Vapor Apparel features Intera’s permanent moisture wicking technology. Their unique fabrics not only wick moisture for climate control & comfort, but are anti-microbial and stain resistant.